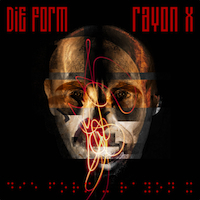 "Le nouvel album de DIE FORM "Rayon X" a finalement vu le jour, après trois années de recherches, de réflexions et d'obstination. Les voix se mêlent au grain du souffle amplifié des machines électroniques dans une sorte de chimie des obsessions, surréelle et rêvée. La création est comme un voyage dans le temps et la mémoire, comme une alternative nécessaire à l'illusion de vivre, une thérapie explosive après une phase d'introversion et d'introspection. "Rayon X", the new DIE FORM album finally emerges over a three-year period of research, reflexion and obstinacy. "Music is the language of emotions", this can be the guiding principle - the electrical current - for this new project, in which hybrid images composed of layers echo the hypnotic structure of the music. The voices mingle with the grain of the amplified breath of the electronic machines in a kind of surreal and dreamt obsessions chemistry. Creation is like a journey through time and memory, like a necessary alternative to the illusion to live, like an explosive therapy after a phase of introversion and introspection. There is always this spark of mystery, this attraction towards the void and the dead black, in search of the thrill and the flash, of the ultimate pleasure, despite fear and doubt.